Having studied enough American Indian Tribes over the years, I have grown accustomed to creation myths that each Tribe assigns itself as its reason for being. And the definition of “chutzpah” that I’ve been taught is that of a young man on trial for murdering his parents, who throws himself on the mercy of the Court on grounds that he is an orphan. That, as Alison Weir has made clear, is Israel’s situation. 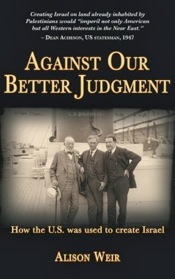 In Against Our Better Judgment, Ms. Weir writes with great clarity how the Zionist movement was able to move politicians, both in America and in England, to legalize a most illegal act–that of stealing an entire nation, and crying foul when those from whom it was stolen complained, then tried to retake the land. Ms. Weir’s in depth research to expose Zionist actions in earlier times provides a solid basis for her conclusions about creating Israel from a land called Palestine. And she documents the intense lobbying done by Israel’s Zionist creators in order to legalize an action that was clearly illegal. We are now living with the consequences of that bit of grand theft, i.e., the continuing violence in the Middle East, affecting everything America might want to do in the Middle East. We only recently have witnessed Bibi Netanyahu’s so far failed effort to have America invade and conquer Iran, a country that obviously is too much of a mouthful for Israel to bite off. Suddenly, even Barak Obama recognizes the danger in following Israel’s advice on how to conduct itself in the Middle East. The President tiptoed to the edge of the abyss but backed away when Israel’s trained seals in the U.S. Congress tried to push the nation over the edge. We saw Congressional supporters of Israel shamefully initiating the dozens of applauses by the Joint Session of Congress when they entertained Prime Minister Netanyahu, who obliged the assembled mass with aggressive applause lines, designed to favor those who have a liking of violence and to show how Israel is “America’s staunchest ally” in the Middle East. The poor fellow did not have an answer. Granted, he was a lower level State Department official, but his lack of an answer was indicative of the lack of a story provided to him by his seniors in the State Department. So Sen. Javits asked him again, and again, and again, trying to have a statement from some government official which Israel’s Lobby could use in its propaganda campaign to maintain Israel’s lofty position in the American mind. But the State Department official was unable to find an answer, which left Sen. Javits and his cohorts to try some other avenue. The Israel-is-a-vital-ally shibboleth has since been made into an overused slogan by supporters of Israel. But each time I hear that phrase, “staunchest ally,” I think of the American sailors on the U.S.S. Liberty, who, during the 1967 Israeli-Arab War, died when the Israeli military was order to destroy its “ally’s” intelligence ship. During that act of friendship, America’s staunchest ally killed some 34 American sailors, and wounded another 170. I also think of Jonathan Pollard, an American employee of our Pentagon, who sold what has been described as “a truckload” of the Pentagon’s secrets to Israel. I say “sold,” because Israel paid Pollard for the secrets, which Israel then traded to the Soviet Union for that country’s relaxation of rules with respect to Jewish emigration from the Soviet Union to Israel. With Ms. Weir’s well researched history in mind, I am forced to think of the cadre of American journalists who lately have assigned “oil” as the reason for George Bush’s Folly–the invasion of Iraq in 2003. They say nothing of the well known fact that George Bush had a number of Israel’s supporters giving him advice on the issue of Iraq. I’ve lost count of the billions of American dollars that were sucked up by that war, as well as the precious American lives that were lost to satisfy Israel’s agents in the Bush Administration, those who convinced President Bush to do something that Israel wanted, but knowing it was better if “America did it.” President Obama should be applauded for refusing to fall into the same trap with respect to Syria. This provocative book documents a history that is essential in understanding today’s world. Scholarly, yet readable, it is a must for all Americans. We all need to know what we have spent by coddling Israel and its aggressions, and why the cost has become more than we have bargained for. James Abourezk is a former U.S. Senator from South Dakota who plunged into the Middle East morass when he saw the cost to our country of Israel’s efforts to connive to have our country do Israel’s dirty work. His memoir, Advise & Dissent, has recently been re-published, along with a new Introduction by Sen. Fred Harris. With Harris effectively locking the market down, buyers are pretty much ensured prices far higher than the market would bear if opened to competition. (Not that I’m advocating for a robust surveillance device marketplace, but if you’re going to spend taxpayers’ money on products to spy on them, the least you can do is try to get the best value for their money… ) Using federal grants also allows these departments to further avoid public scrutiny of the purchase and use by circumventing the normal acquisition process. The Pentagon’s current leadership and most on the House and Senate Armed Services Committees in Congress describe President Obama’s 2015 defense budget request as painfully austere, if not dangerously inadequate. The defense trade press is full of statements from generals, admirals and the other politicians from both political parties that there is not nearly enough money available to buy adequate amounts of new hardware, maintain current pay and benefits or provide even low amounts of training and equipment maintenance. As a result, they are looking for ways to relieve the Pentagon from its penury. Scarcity of money is not their problem. Pentagon costs, taken together with other known national security expenses for 2015, will exceed $1 Trillion. How can that be? The trade press is full of statements about the Pentagon’s $495.6 billion budget and how low that is. There is much more than $495.6 billion in the budget for the Pentagon, and there are piles of national security spending outside the Pentagon-all of it as elemental for national security as any new aircraft and ships and the morale and well-being of our troops. The table below details what a careful observer will find in President Obama’s 2015 budget presentation materials. The amounts for the Pentagon are well above the advertised $495.6 billion, and there are several non-Pentagon accounts that are clearly relevant. DOD Base Budget (Discretionary) 496.0 495.6 The “base” budget purportedly contains all routine, peacetime expenses; however, DOD and Congress have loaded tens of billions of such “base” spending into the Overseas Contingency Operations fund for declared wartime expenses. See below. DOD Base Budget (Mandatory) 5.7 6.2 DOD often does not count this “mandatory” spending in its budget presentations to the public; however, being for military retirement and other DOD-only spending, it is as much a part of the DOD budget as military pay and acquisition. DOD Base Budget (Total) 501.7 501.8 “Total” spending is discretionary and mandatory combined. Overseas Contingency Operations (OCO) 85.2 79.4 The $85.2 billion in 2014 contains at least $30 billion in “base” budget spending; read here and here. The $79.4 billion for 2015 is a “place holder” pending a decision on the actual amount to be requested, which may take months. The ultimate 2015 OCO request may be smaller, but that is not certain–given past behavior. DOE/Nuclear (Total) 18.6 19.4 For nuclear weapons activities. “Defense-related activities” (Total) 8.2 36.0 This spending is usually just for international FBI activities, Selective Service, the National Defense Stockpile and other miscellaneous defense-related activities. For 2015 OMB added a $27.7 billion “Opportunity, Growth and Security Initiative” that includes readiness and “wish list” DOD spending-the latter described here..
National Defense (Total) 613.6 636.6 This is the OMB budget function “National Defense” (also known as “050″) which is sometimes confused as Pentagon-only spending. Military Retirement Costs Not Scored to DOD 35.8 37.8 This category shows funds paid by the Treasury for military retirement programs, minus interest and contributions from the DOD military personnel budget. The data for the amounts shown here are in functions 600, 900 and 950. As DOD-unique spending they should be displayed as part of the DOD budget, but they are not by either DOD or OMB. DOD Retiree Health Care Fund Costs 1.1 0.1 Shown are nets costs to the Treasury for this DOD health care program. See functions 550 and 950. As DOD-unique spending, they should be displayed as part of the DOD budget, but they are not by either DOD or OMB. Veterans Affairs (Total) 151.3 161.2 These costs are projected to increase to $238.1 billion in 2024 as the human costs of the wars in Iraq and Afghanistan continue to grow. International Affairs (Total) 38.5 39.0 The amount for the International Affairs budget function (150) do not include its share of the yet to be determined request for OCO funding in this budget function for 2015. Homeland Security (Total) 51.0 52.1 Includes Homeland Security spending in DHS for federal agencies not shown on this table (thereby excluding DOD, DOE, State and VA). Share of Interest on the Debt 76.3 82.7 Total On-Budget Federal Budget Authority is $2.9 trillion in 2014 and $3.2 trillion in 2015. Total gross interest paid on Treasury debt is $254.3 billion in 2014 and $285.3 billion in 2015. The calculable shares of defense-related spending relative to the federal totals are 30% in 2014 and 29% in 2015. Note the various ways the Pentagon augments its own budget well above the $495.6 billion that is frequently cited by the people seeking more money. * There is the additional “placeholder” amount for the wars in Afghanistan and elsewhere ($79.4 billion), which may or may not turn out to be smaller once the formal request for this spending is compiled and Congress is finished fiddling with it: adding huge amounts of non-war (or “base”) spending to this account by both DOD and Congress is routine. * There is also the $6.2 billion in “mandatory” (or entitlement) spending the Pentagon’s complete budget must include for military retirement and other DOD-only programs. * There is the Pentagon’s $26 billion dollar portion of the “Opportunity, Growth and Security Initiative” (a slush fund if ever there were one) that OMB and Secretary of Defense Hagel have dreamed up–to the applause of the Joint Chiefs of Staff. * While some in the press have caught most of the above additions, they virtually never spot the additional money the Treasury pays out for additional military retirement ($37.8 billion in 2015) and DOD healthcare (just $100 million in 2015 but more in other years). $39 billion for the activities of the Department of State and related agencies-for international security and the exercise of US power abroad. With the addition of an equitable share of the interest on the national debt that is attributable to this spending, it all adds up to $1.0095 trillion. It is that amount, not $495.6 billion, that US taxpayers are being asked to pay out in 2015 for “defense,” defined generically. However, you will not find that number in the talking points of the Joint Chiefs of Staff, Secretary Hagel, or most Republicans and Democrats on the House and Senate Armed Services Committees. They are arguing that times are tough and if still more money can be found, it should go to these accounts. There is another perspective to measure defense spending in 2015. We can compare just the amounts formally requested for the Pentagon (the “base” budget plus the “placeholder” amount for Overseas Contingency Operations) to what has been spent historically. By converting annual Pentagon spending to “constant” (inflation adjusted) dollars adjusted to their 2015 value, and by using the economy-wide GDP measure of inflation for doing so (not the Pentagon’s own hopelessly self-serving measure of inflation), we can compare the 2015 Pentagon budget to its post-World War Two history. See the figure below. 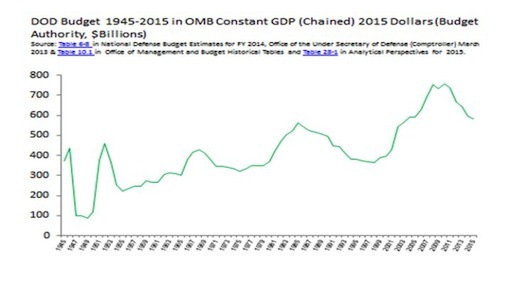 This graph tells us that the 2015 level of Pentagon spending would return us to the same overall level as 2005 when Donald Rumsfeld was secretary of defense and the DOD budget was generally considered flush with money and supporting substantial fighting in both the Iraq and Afghanistan wars. Note also that this is a level of spending that matches the peak of the Ronald Reagan years that was thought by its advocates to be a US build up so massive it was intimidating the Soviet Union into collapse. The 2015 level is also an amount that significantly exceeds the peaks of the Korea and Vietnam wars-both of them higher intensity conflicts with hundreds of thousands more US troops deployed than are currently in Afghanistan. To repeat, the problem is not scarcity of money. The problem is how it is being spent. We are getting very little defense–training, maintenance, hardware, and troops–for a gigantic amount of money. By virtue of how they characterize $1 trillion dollars as penury, our national security leaders in the Pentagon and Congress are clearly incapable of dealing with the problem. Our equipment is outrageously expensive and yet too much of it is a step backwards in effectiveness. Since the mid-1990s Congress has bulldozed money into across-the-board pay raises, double pensions for many military retirees, significantly increased benefits for the survivors of World War Two veterans and much else that has much more to do with placating constituencies than addressing 21st century security problems. In addition, the Pentagon’s civilian and military leadership has bloated itself to historically unprecedented levels of overhead. Worse yet, none of them have even bothered to fundamentally understand the dimension of the problems because, under their tutelage, the Pentagon remains unaudited and un-auditable, which will remain the case even after it meets its decades overdue, and embarrassingly modest, financial management goals-which, by the way, it will do no time soon. One more time: the problem is not scarcity of money. Questions need to asked about the real role of the European Union’s foreign policy chief Catherine Ashton. With her demeanor of quiet diplomacy and down-to-earth style, some may see her as a fixer of diplomatic solutions. But, increasingly, it seems that the British appointed European bureaucrat is playing a more sinister role of finessing regime change on behalf of Washington and its NATO allies. Ashton – whose official British title is “Lady Ashton” – was made a member of the House of Lords under Britain’s archaic and undemocratic honors system back in 1999. She has never been elected by a popular vote, yet she has risen by political patronage to become Europe’s top diplomat deciding the fate of foreign states and millions of lives. Up to now, Ashton has enjoyed something of a benevolent image akin to a “well-meaning auntie figure”. Mild-mannered and modest, she might be seen as an honest broker. For example, she is credited with helping to broker the P5+1 interim nuclear deal with Iran last November. However, the covert involvement of Western governments in orchestrating the coup d’état in Ukraine and Ashton’s de facto participation in this regime-change operation makes her much less a lady and more a cynical operator who is far from an honest broker. When the street protests sparked off in Kiev at the end of November, allegedly as a result of incumbent President Viktor Yanukovych’s refusal to sign a EU trade pact, Ashton was among the trail of top Western political figures who took it upon themselves to “mediate” in the ensuing political crisis. While Ashton appeared to be mediating between the Ukrainian government and protesters in Kiev’s Maidan Square, she was nevertheless all the while stirring up the street demonstrations. She was photographed with protest leaders, including Arseniy Yatsenyuk, who is now the self-styled prime minister of Ukraine, even though these agitators were urging neo-Nazi violence and widespread law breaking. The EU foreign policy chief was thus instrumental in lending credibility and legitimacy to what can only be described as a violent seizure of government. The criminal involvement of the American CIA and its various non-governmental incarnations in fomenting this coup is well documented. That makes Ashton a CIA collaborator. Ashton deserves further scrutiny because more evidence is emerging that the street massacre in Kiev last month precipitating the seizure of Ukraine’s government was carried out by snipers working for the Western-backed coup plotters. The latest revelations from Ukraine’s former security chief confirm that the shootings were orchestrated by members of the Western-backed coalition – the coalition that has since taken political power in Kiev. Aleksandr Yakimenko told Russian media this week that the building from where the snipers fired fatal shots at police and protesters on February 20 was under the full control of the organizers of the Maidan demonstrations. In particular, Andriy Parubiy, who has since been appointed by the Kiev junta as head of the National Security and Defense Council, prevented any measures at the time of the shootings to arrest the snipers, says Yakimenko. Yet, Ashton, along with other European and American leaders, has said little about what appears to be a huge crime. Indeed, she has endorsed the ruling administration in Kiev as the “interim government of Ukraine” even though the evidence points to the new political office holders in Kiev as being an unelected junta that came to power through acts of terrorism. A phone call leaked last week showed that the EU foreign policy chief knew about allegations of the massacre from as early as February 26 when Ashton was told by Estonia’s top diplomat Urmas Paet about the snipers working for the Ukrainian opposition. Up to 100 people, including civilians and police were killed in the gunfire on February 20. Well, since then, Ashton has kept a conspicuous silence on what appears to be an act of mass murder by the Western-backed opposition. Former Ukrainian security chief Yakimenko says evidence points to the involvement of US Special Forces. He says the agitators worked closely with the US embassy in Kiev. Considering the grave criminal implications, it is revealing that Ashton had so little to say in response to the initial news over the phone from the Estonian foreign minister. That suggests that Ashton already knew of the criminal conspiracy to use terrorism in order to grab power, or she is now choosing to cover up. Either way, Ashton’s silence on the sinister events in Kiev is damning and especially so as more incriminating evidence emerges about the incident being a Western state-sponsored act of terrorism. Russia is calling for an international inquiry, but Aston and her Western allies are saying nothing. What has become of the supposed honest broker? Last weekend, the Lady was in Tehran on what was hailed as a landmark visit. It was her first visit to Iran since she became EU foreign policy chief in 2009. Rather mischievously, she announced in Tehran that there was “no guarantee” that a comprehensive agreement to the P5+1 nuclear negotiations would be achieved. Ashton then offended the Iranian government when she embarked on “unsanctioned” meetings with various political dissident groups while in Tehran – unrelated to the nuclear issue. Some Iranian parliamentarians accused her of interfering in Iranian internal affairs. Was that Ashton’s calling card for more such agitation in Iran, just like in Ukraine? This week, US president Barack Obama signed off on a continuation of American sanctions against Iran for another year, which does not bode well for a comprehensive settlement to the decade-old nuclear dispute and for the lifting of Western sanctions punishing the Iranian people. Given her role in facilitating Western regime change in Ukraine, which has since led to a dangerous escalation of tensions between Washington, its European allies and Russia, Lady Ashton is showing herself to be someone who cannot be trusted. Not so much Lady Ashton, more like Shady Ashton. The Israeli Haaretz newspaper unveiled, Thursday morning, that an Israeli soldier pointed his gun at a handcuffed Palestinian boy, during an investigation after arresting him in Nabi Saleh village, near the West Bank city of Ramallah. The Al Ray newspaper pointed out that Israeli forces arrested four boys from Nabi Saleh village three weeks ago, under the pretext of throwing stones. He (one suspect) was led to Benjamin police station for investigation. There, one of the soldiers who participated in the arrest attended, and was filmed while directing his gun towards the boy in the interrogation room. The soldier left the room after investigation officers arrived, the newspaper added. It was noted, by the court, that the documentation of the stone-throwing incident is not professional, and that the boys’ identities are in doubt. For 46 years the bridge connecting the West Bank with Jordan has been a source of hardships, humiliations and extremely long and unnecessary delays, not to mention cumbersome and exaggerated body and baggage searches. What happened on March 10 is a symptom of the occupation versus occupied paradigm that must come to an end. A 38-year-old Jordanian father of two and a sitting judge in Amman’s Court of First Instance, attempted to travel to Nablus like many Palestinians and Jordanians of Palestinian origin. His altercation with Israeli soldiers that ended with his death must be a warning flag that this injustice and humiliation cannot continue. Anyone who crosses the King Hussein Bridge knows very well how the Israelis have for decades forged a shameful occupier-occupied relationship with the power of their guns. The Oscar-winning film Twelve Years a Slave, perfectly illustrates the way that the oppressed absorb all kinds of humiliation simply in order to survive as they wait for salvation. Raed Zuaiter, the Jordanian judge, like any other human being, apparently walked into this mess without the added shield of years of humiliation and he couldn’t accept it. For their part, the Israeli soldiers, brainwashed to suspect every passenger as a potential “terrorist,” viewed the rebellion against accepting the occupier-occupied paradigm as enough proof that the rebellious person must be a terrorist. As they say, the rest is history. The Israeli spin machine quickly went into action. The often repeated defense was that Zuaiter went for the soldier’s gun. Later it was adjusted that he went for his throat, attempting to strangle him. The “terrorist” label also required some audio. So again the spin machine fabricated that the judge yelled “Allahu Akbar, Allahu Akbar” before lunging for the soldier’s gun (or throat), thus confirming that he was a terrorist. Of course much of the speculation as to what happened and when could easily be put to rest if footage from the most camera-covered spot at the bridge (the first few meters into the Israeli controlled area) is made available. But alas, the camera is now said to have been inoperative that day. How convenient. But there is a tiny fact that is hard to refute. How did the bus carrying Zuaiter enter the Israeli occupied territories. A metal bar and four metal pistons make it impossible for any vehicle to enter until someone presses a remote-controlled button. The buttons are located in a windowless room with lots of cameras that show the operators who is coming, what license plate they hold and so on. Naturally, addressing the problem that caused the untimely death of an innocent Jordanian is currently focused on the logistics and mechanics of what happened, but there is a need to look at the context of what is happening and how to avoid the recurrence of such trigger-happy acts. In the negotiations about the implementation of the Oslo Accords, the Palestinians insisted that even during the interim period no Israeli soldier should have any face-to-face contact with passengers. The Israelis designed a plan where they sit behind one-way mirrors and control the bridge from this vantage point. The plan, which included the presence of unarmed Palestinian police, was operational for a short time at the end of the 1990s but was scrapped when the second Intifada broke in October 2000. Since then the call to return to the pre-October status throughout the occupied territories and on the bridge has been made repeatedly but no action was taken. The roadmap included a section for the return of the Palestinian police to the bridge, but this was never implemented. In addition to the need to keep brainwashed, heavily armed young Israeli soldiers as far away from traveling civilians as possible, there are other decisions that can help reduce the tension on the bridge. For example, the crossing should be open around the clock in order to ease the long waiting period that add to the anger and frustration. Israelis say that they can’t cover the cost of 24-hour staff but many Palestinians think that they don’t care while others believe that this is deliberate to maintain the occupier-occupied paradigm. The best and most effective way to reduce the tensions and tragedies such as the murder of the Jordanian judge, is to end the occupation and totally remove the unwanted Israeli occupiers from Palestinian territories. In the meantime, people of goodwill must agree that the current status quo on the King Hussein Bridge is untenable. Serious and deep changes are required in order to guarantee that what happened on March 10 to an innocent Jordanian will not take place again. 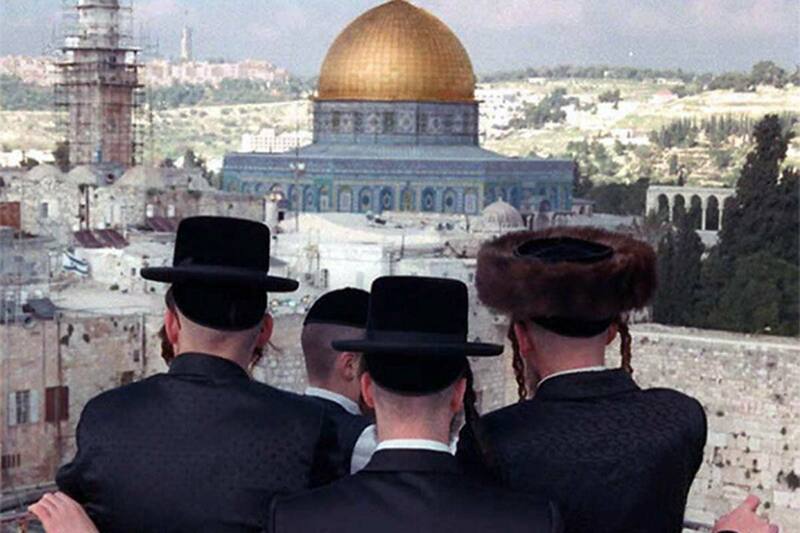 Some 78 per cent of religious Jews want to enter Al-Aqsa Mosque compared to only 18 per cent from the national Haredim, a new poll has revealed. Published by Maagar Mohot and conducted in cooperation with the Temple Organisations, the survey showed that 45 per cent of secular Jews wanted to enter Al-Aqsa Mosque. About 80 per cent of the national religious Jews believe that entering Al-Aqsa Mosque has to keep up with the teachings of Judaism, which stipulate carrying out religious rituals upon accessing certain places inside the mosque. Regarding tourism visits to the mosque, the poll showed that 68 per cent of the national religious Jews want to enter Al-Aqsa as tourists, compared with 60 per cent of secular Jews and 20 per cent of Haredim. The poll showed that 73 per cent of national religious Jews support building a Jewish temple in Al-Aqsa Mosque. Commenting on the results of the poll, Al-Aqsa Foundation for Waqf and Islamic Heritage said that this reaffirms that all facets of Israeli society want to invade Al-Aqsa Mosque and build a Jewish Temple in its place. The Jewish Ateret Cohanim organisation said it has bought “a very large and strategic building” situated across from the Old City in the heart of the commercial Palestinian neighbourhood in Jerusalem and it aims to change it into a religious school, Israeli newspaper Haaretz said today. Ateret Cohanim is active in buying Arabic Palestinian properties in the old city of Jerusalem, as well as in East Jerusalem. It changes the properties, which were owned by Arabs, into Jewish facilities for the purpose of Judaising Jerusalem. Pictures of the building were attached to the letter. Built during the Jordanian control over Jerusalem, the building served as the headquarters of the central post office in Jerusalem, as well as a police station. Luria told the members of his organisation that the building is to be used as an educational centre for religious school students. Another message sent via e-mail on Tuesday was entitled: “Great news from Ateret Cohanim”. The letter tells the members that the organisation has bought the building of the central post office with funds from a generous donor. The message called upon organisation members to keep the news secret until it gained control of the building during Passover, which starts on April 14. Luria sent the message to the organisation members in the occasion of the Jewish Purim, when the Jews are called to generously give alms. The message called upon members to donate towards the building of a kitchen, bedrooms, hall and offices, as well as for furnishing the security room. The message said this is the biggest seizure of an Arabic building in the Old City, which is considered the heart of the commercial centre of Jerusalem. It noted that renovation works have been carried out silently. The building is under the Israeli Land Authority which rented it to the Israeli Post Authority. Similar to Ateret Cohanim, the Israel Elad organisation has been carrying on Judaisation activities. It buys properties in central Arabic neighbourhoods and brings Jews to live in them. Sigmund said that this settlement effort is supported by the Israeli government and it aimed at creating a new reality in Jerusalem. Settlers have won a victory in their ongoing attempt to grab land for a new settlement in Hebron. On 11 March 2014, the Israeli Supreme Court agreed to hand over the Al-Rajabi building in the Old City of Hebron to settlers, despite the grim humanitarian impacts of the decision on Palestinians living in the neighborhood. The Hebron Rehabilitation Committee (HRC) has appealed to the international community to speak out against this violation of Palestinian property rights, and to use all means available to prevent the creation of a new settlement in the Old City of Hebron. Settlers claimed ownership of Al-Rajabi house on 19 September 2007, when a group of them stormed into the building in the middle of the night. In November 2008, the court found that the settler’s purchase documents were forged and evicted them, placing the building under military control pending a final decision. In reaction, Hebron settlers set fire to Palestinian homes, farms, olive trees, and vehicles in the area. Six Palestinians were injured, two with live ammunition. On 11 March 2014, the Israeli Supreme Court ruled that the Palestinian owner of the building must, against his will, accept payment from Israeli settlers in the amount specified in the forged sale documents. A thirty minute walk from the Al Rajabi building settlers are using “archaeology” to rewrite the history of the city and take control of two large plots of land on top of the hilly neighborhood of Tel Rumeida. On 5 January, Israeli settlers and soldiers uprooted fifty almond trees belonging to the Abu Heikal family, and began digging on two plots of land that surround the family’s home, and which the family has leased and cultivated for sixty-five years. Since January, the settlers have used heavy earth-moving equipment to remove truckloads of soil from the orchard. Tall metal fences now cut the Abu Heikal home off from the orchard, leaving the house accessible by only a narrow drive. Fencing off the land, which soldiers have declared a “closed military zone,” has also isolated portions of the Tel Rumeida neighborhood, making it difficult for residents to walk to shops and the nearby mosque. settlers digging on Tel Rumeida. In this photo, the grave has been partially removed. According to Hamed Salem, chairperson of Birzeit University’s archaeology department, the dig is illegal and is merely an attempt to “advance the settler’s political agenda by using archaeology to justify their presence in Hebron.” An archaeologist from the Palestinian Ministry of Antiquities recently attempted to inspect the site but was denied access. The Israeli Culture Ministry and Civil Administration are financing the dig, and expect it to cost an estimated NIS seven million. Residents of Tel Rumeida fear that because such a large sum has been allocated there may be plans for much greater destruction of surrounding ancient olive trees and orchards. The Abu Heikal family is currently challenging the legality of the excavation in the Israeli Civil Court system. Roughly midway between the Al Rajabi building and Tel Rumeida, near the Ibrahimi Mosque, settlers are attempting to gain control of five buildings: the Bouderi House and the Tomb of Abner, both directly outside the entrance to the Ibrahimi Mosque, the Ashhab Shops, across the street from the Gutnick Center, which is directly in front of the Ibrahimi Mosque, the Abu Rajab house near Checkpoint 209, and the Al-Sharif House, the front door of which opens onto the street just below the Ibrahimi Mosque. In recent months settlers and soldiers seeking to access the Al-Sharif building have attempted to open the house from the front directly below the mosque by breaking open a welded door, and have repeatedly invaded the home of the Al-Atrash family, which shares an enclosed courtyard with the Al Sharif building. If settlers are allowed to occupy these seven sites the humanitarian impacts on residents of Hebron’s Old City neighborhoods will be devastating. The targeted properties are links in a chain that, if completed, would effectively encircle the Ibrahimi Mosque and link the four existing settlements inside the Old City to the larger settlement of Kiryat Arba, which borders the Old City. This connection would cut off Palestinian neighborhoods and homes from access to schools and services, and would put all of the Old City under increased risk of settler incursions and violence. Currently about 500 settlers live in the four downtown Hebron settlements of Beit Hadassah, Avraham Avinu, Beit Romano, and Tel Rumeida. An additional 7,000 live in Kiryat Arba.